This incredible trek in the Everest region is not just a thrilling trip but also a picturesque trek. Everest High Passes is one of the classic treks of the world as it trails to Everest Base Camp followed by Cho La (5,380m/17,650ft) and Renjo La (5,388m/17,513ft) passes. The trek starts from Lukla heading towards Namche bazaar. During our trek we encounter authentic Sherpa culture in the mountainous villages and the warm hospitality of the families of inborn mountaineers. You will be in Buddhist Sherpa territory where you will see colorful prayer flags, Buddhist chanting in the walls and monasteries. Kathmandu is the cultural heart of Nepal and has been a famous destination for tourists ever since Nepal opened its borders to visitors. Today after breakfast, we will explore Kathmandu valley, a guided tour will be conducted to major world heritage sites inside the valley. Out city tour expert will take you to Kathmandu Durbar Square, the traditional heart of Kathmandu and an architecturally extraordinary complex of ancient palaces, temples, courtyards and shrines. You are then taken to Swayambhunath (monkey temple) which is the glorious ancient religious architecture and center faith of Hinduism and Buddhism. Further, you will be visiting Buddhist shrine of Boudhanath which is one of the largest stupa in the world and the sacred Pashupatinath temple that lies on the bank of Bagmati River in Kathmandu. After the tour you will have ample of time to prepare for your trek and buy or rent all the required trekking equipment. Overnight at Hotel. After an early breakfast you will be transferred to the domestic airport for your 35 mins. Spectacular scenic flight to the mountain airstrip at Lukla. After reaching at Lukla we meet our crew and set off our hike to Phakding following ridge on the left bank of milky Dudh Koshi River to the village of Phakding. A beautiful vistas of the Kusum Kangraru Mountain can be seen from Phakding. The village of Phakding situated in the Dudh Koshi River valley north of Lukla. Stay overnight at teahouse. · Scenic flight by twin-otter plane to Lukla airport at the altitude of 2,840m. · Beautiful walk through the picturesque village. · Views of beautiful rhododendron and pine trees. · Splendid views of Kusumkang, Kongde Mountain. Day 04: Phakding to Namche Bazaar (3,445m/11,302 ft); 5 to 6 hours walking. Leaving Phakding behind, we will start today’s trek by climbing up to the traditional town of Namche Bazar which is also known as ‘gateway to Everest ‘and town of Sherpa ethnicity. Nestled in the Himalayas, Namche is considered as a centuries old trading center between Nepal and Tibet. After a hearty breakfast, we set out our trek following the trail continues north up the glacial waters of the Dudh Koshi River. We walk through rolling terrain, past traditional homes, cultivated fields, forests and cross bridges. Trekking half way up the hill you can see first glimpse of Mount Everest and Lhotse A few hours of walking will lead you to the Sherpa capital village of Namche Bazaar crossing path surrounded by pines. Namche is the largest town in Khumbu region, surrounded on three sides by mountain ranges and opens out only where it faces the Dudh Koshi. This vibrant village is a central hub of the area and food, sundries and even mountain climbing equipment can be purchased here. In addition you can see yaks roaming around the streets with magical sounds of their bells. You can enjoy the splendid views of Everest, Nuptse, Ama Dablam and Lhotse from the top of the hillside town. · Crossing of 4 suspension bridges. · Scenic beauty, deep canyon and sky-high cliffs at the backdrop is phenomenal. Today we take a rest day as a part of acclimatization. There is ample of things to do in and around.We can take a short walk above the town to see the backdrop of Everest. You can also view the beautiful scenery from the national park center and museum just above the town. You can visit Sherpa Culture Museum and get back to the lodge for lunch and in the afternoon you can either relax or explore the Bazaar. 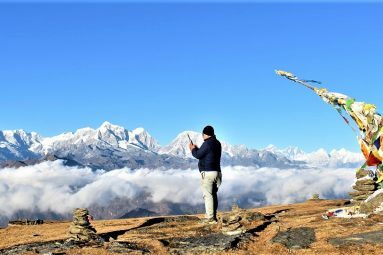 After having breakfast at lodge in Namche, we start our trekking with the ridge and flat level mountain trail that offers excellent panoramas of Thamserku, Kantega, and Kusum Kangaru. After walking few hours on flat zigzags trail we descend to the river and arrive at Phunki Tenga. We climb through rhododendron forest to the Tengbuche. About 15 minutes walk from Tengboche we will reach Debuche, the village of Sherpa settlement. After having breakfast, we start our trek and it will be short trek to the Pangboche village. The trail drops all the way down suspension bridge on the Imja Khola and climbs to Pangboche village. We will reach there by afternoon having enough time to rest and explore nearby monasteries in Pangboche. Today will also help us adapting the altitude as tomorrow will be a higher destination and a longer trek. Leaving Pangboche behind we take the high trail, considered to be one of the most beautiful trails with outstanding view of enormous mountain and deep valley. 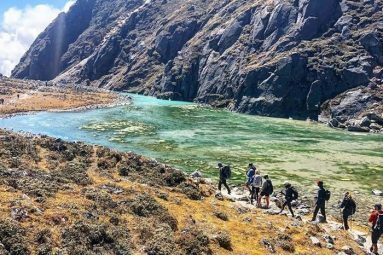 Trekking in dry hills along the rock strewn trails we gradually slide up crossing through the typical Sherpa villages and on the way we might be lucky enough to spot the musk deer, mountain goats and different birds. Dingboche, situated at the foot of soaring Amadablam Mountain is another attraction, views of countless other neighboring mountains which are hidden from Namche view. Pass through several Mani walls, prayer flags on the way. The Everest Base Camp Trek has now gained the altitude above (4,000m/13,123 ft). Therefore, today we have one more acclimatization day. A morning excursion for acclimatization will be conducted after breakfast. Hike to the Nagarjun Hill (5,050m/16,568ft) or Chhukung Village would be best options. We will return to Dingboche and after lunch, you would basically have free time for rest and relax. After having early breakfast, we initiate our 5 hours excursion ascending slowly all along a plateau of yak herder shelters. You will have pleasant walk passing through magnificent mountains like Cholatse, Lobuche and Pumari spread out before us in spectacular landscape. After two and half hours gradual walk, we will arrive at Thughla. From Thughla the trail goes directly up the terminal moraine of the Khumbu Glacier before turning left just pass the climber and Sherpa memorial. From here we walk leveled path and gradual ascend along the river to Lobuche where we will stay overnight. You can see Pyramid Hotel in Lobuche with solar panel roofs. Today our destination is the Everest Base Camp (EBC). After breakfast, we get ready and begin our trek by following the rocky terrain. We will enjoy the magnificent vistas of the pool of Khumbu glacier and icebergs. After leaving Lobuche, the trail to Gorak Shep is extraordinary where we walk through the rocky moraine undulate trail. After a lunch break at Gorak Sep we walk to Everest base camp. The trail is mainly on rocky moraine before traversing over on to the glacier. There is a spectacular vista of the well-known Khumbu icefall from the base camp. After exploring base camp and its surrounding we come down back to Gorak Sep where we stay overnight. Wonderful view of Mt. Pumori, Mt. Nuptse and other magnificent peaks. Views of Pumori, Everest, Nuptse, Amadablam and several countless peaks. Savour picturesque vistas of Himalayan landscapes. ‘Kala’ means black and ‘pathar’ rock, together being ‘Kalapathar’ or Black rock. Today we rise early morning and get prepare to climb Kalapathar. The trek can be tough and freezing cold as the place is very windy; the epic climb to Kalapathar is not easy. We start to take steep climb to Kalapathar for about 3 ½ hours. Once you reach at the summit you can enjoy the view from the top surpasses the wildest imaginations. You can see truly an unobstructed view of the highest mountain in the world i.e. Mt. Everest (8,848m/29,000ft) including the full spread of Khumbu Himalayas. Alongside, Mt. Pumori looks great close up. As the sunset, the views are more colorful. Kalapattar is one of the prime highlights of Everest Base Camp Trek. Kalapathar offers the best views of Mt. Everest, Nuptse, Pumori and Ama Dablam along with the entire mountain views of Khumbu Himalayan range. After breakfast we leave Lobuche behind and continue our trek walking flat trails and take a gradual ascend for half an hour that takes you to Dzongla. The trail offers enthralling experience of the Himalayan alpine environment. Trek takes you many lakes where the backdrop is just eye-catching. Today will be an early start for our trek, the view in today’s trail will be magnificent as we enter that of Cho Oyu, the sixth highest peak in the world. Crossing the pass is a challenging task as the trail includes a steep scramble up rock boulders then a walk across the gentle ascending and finally a snow covered glacier that caps the pass. However, we descend steep boulder strewn slopes to the Gokyo valley below. This is a valley of turquoise lakes and great glaciers. For the first (and steepest) part of the descent there are discernible paths that zigzag down the mountainside – slippery in snow! The ground then levels out and the path all but disappears as we hop across a field of boulders. Finally we climb a gentle slope to the top, from where it’s all downhill, following a narrow river valley all the way to its base where we overnight at Thangnag, a small Sherpa settlement nestled beneath great rock walls, just a stone’s throw from the Ngozumba Glacier. Today is a short trek; we cross the glacier and gradual ascend the lateral moraine valley past beautiful lakes to the village of Gokyo. We will reach there for lunch and after lunch we have option either to climb Gokyo Ri or rest for now and climb Gokyo Ri tomorrow. We stay overnight in Gokyo. Gokyo village stands by the third lake and Cho-Oyu Mountain as a backdrop sets marvelous and impressive sight. An early start is the best opportunity to get the best view so we wake up early in the morning to hike to Gokyo Ri for panoramic Himalayan views such as Mt. Everest (8,848m/29,028ft), MtLhotse(8,516m/27,939ft), Mt. Makalu( 8,463m/27765ft), Mt.Cho Oyu (8,201m/26,906ft), Mt. Kangchung(6,063m/19,881ft), Mt. Amadablam( 6,856m/22,493ft), Mt. Thamserku( 6,723m/22,057ft), Mt. Kantega (6,685m/21,932ft), Mt.Kusum Khagaru (6,367m20,889ft), Mt.Kongde (6,011m19,721ft), Mt.Twache peak (6,367m20,889ft), Mt. Cholaste( 6,335m/20,784ft). We will trek through Gokyo Lake and descend back to Gokyo for overnight. Today’s trek will be long and challenging one. However, crossing of Renjo La will be exciting descend into remote northern valley where access is restricted and the landscape is progressively that of Tibetan valleys beyond. After a long trek we will reach Langden. Many peaks can be seen from Renjo La Pass such as Everest, Lhotse Taboche sparkling due to the sun rays upon them. Renjo La offers beautiful vistas of the Everest region as well with the third Gokyo lake and the village. With an early breakfast we start our trek by descending downhill to Lukla. We will trek along the Dudhkoshi River, pine forests, hamlets and crop field with the views of mountain like Kusum Kangguru, Khumutse, Taboche etc. When we reach Lukla, we check in at lodge and get some rest and stay overnight here. Backdrops of Kusum Kangguru, Khumutse, Taboche and Thamserku along the trail. We will have an early breakfast and fly back to Kathmandu from Lukla airport. You will then be accompanied to your hotel and have time to take rest and relax after a long amazing trek. Stay overnight in hotel. It’s also spare day in case of bad weather in Lukla if we could not fly on scheduled date and time or we can organize you a guided day tour in or around Kathmandu. You can spend your leisure time by shopping souvenir for your beloved ones or simply relax after exhausting but momentous adventure. It is time to fly back to home keeping all the terrifying experiences of Nepal in mind. The representative from Nepal Sanctuary Treks will transfer you to TIA airport where you should check-in 3 hours prior your scheduled flight. Mount Everest is the home of “black jumping spider”. It has been found at altitudes as high as 6700 meters above sea level. Major plants that are found including birch, juniper, blue pines, firs, bamboo, wild rose, rhododendron, and hemlock etc. Sherpa and Tibetan Buddhist culture is everywhere throughout the region.